A newly released photo mosaic from NASA’s Mars rover Curiosity reveals the huge robot and its exotic Red Planet landing site in crisp detail. 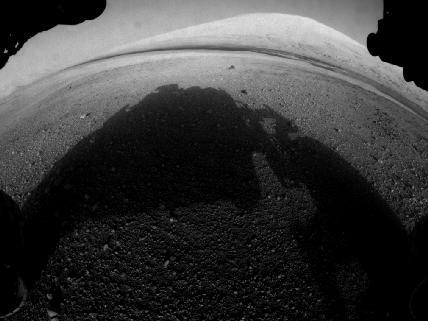 Curiosity snapped the high-resolution self-portrait with its navigation cameras on the night of Aug. 7, just two days after it touched down inside Mars’ huge Gale Crater. NASA released the image — which is composed of 20 full-frame navcam shots — during a press conference Friday (Aug. 17). “What’s really exciting about this is that we see the rover — a self-portrait, with the rim of Gale Crater in the background,” said Curiosity chief scientist John Grotzinger, a geologist at Caltech in Pasadena. News of Curiosity’s safe touchdown following the 13-thousand-to-zero-mile-an-hour descent to the Red Planet’s surface brought elation and high-fives all around the world. Curiosity begins a two-year investigation of whether Mars is or ever was capable of supporting microbial life.